마한시대의 도읍지로 알려진 익산 왕궁면에서 남쪽으로 2㎞쯤 떨어진 언덕에 자리하고 있는 석탑이다. 1단의 기단(基壇) 위로 5층의 탑신(塔身)을 올린 모습으로, 기단부가 파묻혀 있던 것을 1965년 해체하여 수리하면서 원래의 모습이 드러났다. 탑의 기단은 네 모서리에 8각으로 깎은 주춧돌을 기둥삼아 놓고, 기둥과 기둥 사이에는 길고 큰 네모난 돌을 지그재그로 맞물리게 여러 층 쌓아 올려놓아 목조탑의 형식을 석탑에서 그대로 재현하고 있다. 이 팔각기둥과 네모난 돌들 사이는 흙을 다져서 메웠는데 이 속에서 백제시대의 기와조각이 발견되기도 하였다. 발굴 중에 기단 각 면의 가운데에 2개씩 기둥조각을 새긴 것이 드러났으며, 탑의 1층 지붕돌 가운데와 탑의 중심기둥을 받치는 주춧돌에서 사리장치가 발견되었다. 1층부터 5층까지 탑신부 몸돌의 네 모서리마다 기둥 모양을 새겼으며, 1층 몸돌에는 다시 면의 가운데에 2개씩 기둥 모양을 조각했다. 지붕돌은 얇고 밑은 반듯하나, 네 귀퉁이에서 가볍게 위로 치켜 올려져 있으며, 방울을 달았던 구멍이 뚫려 있다. 각 층 지붕돌의 윗면에는 몸돌을 받치기 위해 다른 돌을 끼워놓았다. 5층 지붕돌 위에는 탑머리장식이 남아있다. 지붕돌이 얇고 넓어 빗물을 받는 낙수면이 평평한 점이나, 탑신부 1층의 지붕돌이 기단보다 넓은 점 등 백제석탑의 양식을 일부 유지하고 있다. 그동안 언제 제작되었는가에 대해 의견이 분분한 상태였으나 1965년 보수작업 때 기단의 구성양식과 기단 안에서 찾아낸 사리장치의 양식이 밝혀지면서 그 시기가 비교적 뚜렷이 밝혀졌다. 즉, 백제의 옛 영토 안에서 고려시대까지 유행하던 백제계 석탑양식에 신라탑의 형식이 일부 어우러진 고려 전기의 작품으로 추측된다. 이 석탑에서 발견된 고려시대의 유물들은 국보 제123호로 일괄지정되어 국립중앙박물관에서 보관하고 있다. 최근 국립부여문화재연구소의 발굴과정에서 지금의 석탑에 앞서 목탑이 있었음을 확인할 수 있는 흔적이 이 탑 밑부분에서 발견되어 다시금 주목을 끌고 있다. 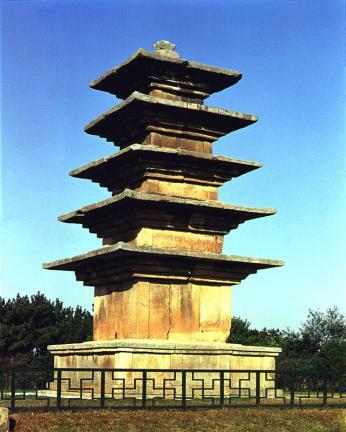 This Five-story Stone Pagoda is located on a hill, about 2 km south of Wanggung-myeon, Iksan, which is known as the capital of Mahan. 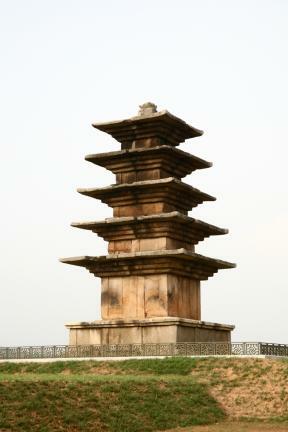 This pagoda consists of five stories, a single-tier foundation and some of the final. 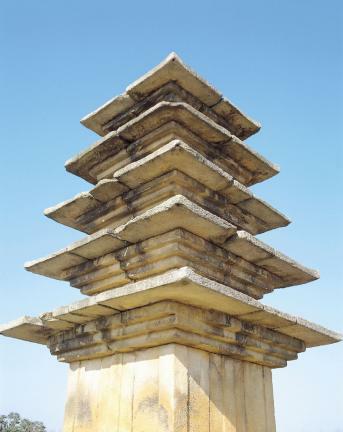 The foundation had been buried in the ground before it was dismantled and restored to the present shape in 1965. 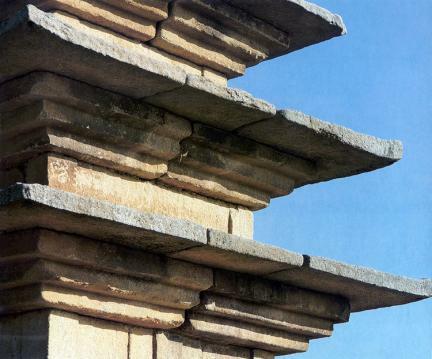 At each corners of the foundation is installed an octagonal corner stone serving as a corner column, between which long, square stones are piled up in imitation of wooden pagodas. 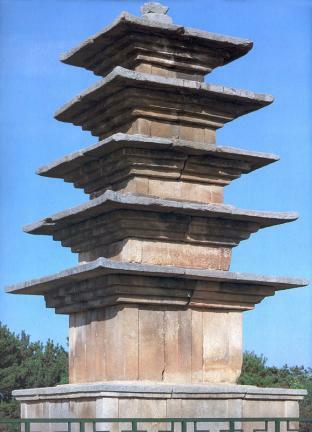 The inside of the columns and stones is filled with earth, in which fragments of Baekje roof tiles are discovered. During the 1965 repair work, a sarira container was retrieved inside the base and the roof of the first story. The repair work also revealed a new fact that two central pillars are carved on each side of the foundation. Each story has a column at all corners, and the first story has two central pillars engraved on all sides. The thin, flat roofs are slightly upturned at the corners. 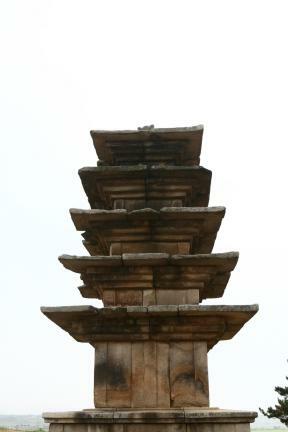 The marks on the corners of the eaves suggest that wind-bells hung there. Each roof has a supporting stone on its top to hold the superstructure. Of the final, a stone base, an upside-down alms bowl, an upward-looking flower and a partly broken ring remain. 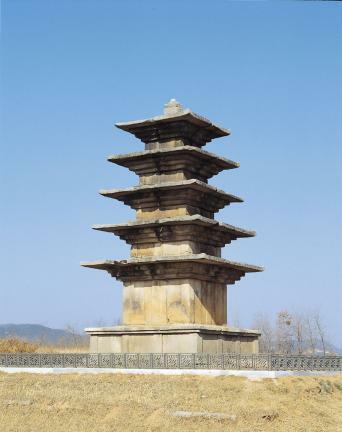 The roofs retain characteristics of Baekje pagodas to some extent, which led to a controversy over the exact date of the pagoda's construction. 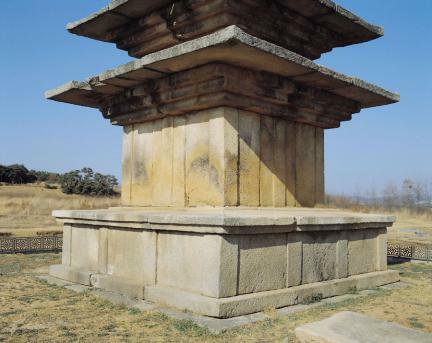 Judging from the composition style of the foundation and the retrieved sarira container, this pagoda seems to have been the work of early Goryeo, which combines the styles of both Baekje and Silla pagodas. The relics retrieved during the 1965 repair work are designated as National Treasure No. 123 and are on display at the National Museum of Korea.